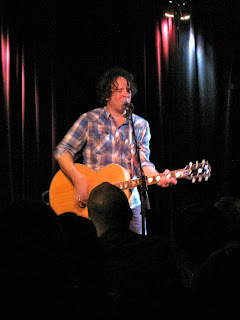 Sunday evening saw criminally-underrated singer-songwriter Grant-Lee Phillips play at the intimate Lestat's Coffee House in San Diego. I went down solo as Allie is still fighting remnants of a sinus infection and possible bronchitis. This would be my first time seeing Grant-Lee solo. I had seen him play with his previous band Grant-Lee Buffalo twice prior - once opening for Ultra Vivid Scene at Chicago's Park West in front of about 15 others waaay back in 1993 and then five years later opening for Willie Nelson (with Emmylou Harris backing!) at Boulder's Fox Theater. Lestat's is a very intimate venue, a small storefront adjacent to their coffee shop with the ambiance of a - well - a converted storefront with wall painted in a deep red and black foam insulation stapled above the stage (which sits all of about 18" higher than the audience). Thankfully the sound quality was stellar, much better than I had expected. Grant's acoustic electric guitar sparkled. Grant-Lee started out with Good Morning Happiness and Strangest Things - also the first two tracks from his two month-old Little Moon record. Being a long-time Grant Lee Buffalo fan, I was eager for him to dip into the hallowed back catalog of that exceptional band. He didn't disappoint, pulling out three tracks from 1994's stellar Mighty Joe Moon over the course of the evening, including Demon Called Deception, Honey Don't Think and Mockingbirds. Canon Powershot in hand, the latter two were captured as videos on the SD card. Unfortunately you can hear my utterly tone deaf / monotone voice singing along to Mockingbirds - so that file was sent to the trash file and subsequently deleted this evening to spare everyone's delicate ears. Must remember to keep my mouth shut - no matter how much I love the song. Here's a link to a similar live recording of it from Schuba's in Chicago a few night prior.